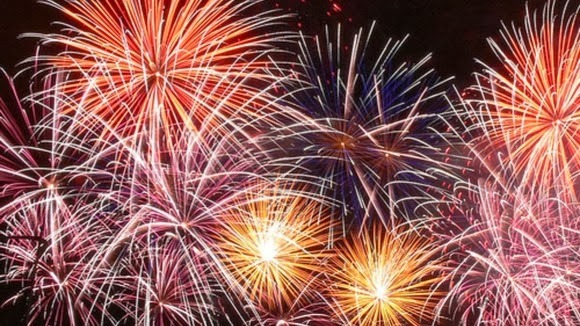 Jungle Red Writers: Remember, Remember the Fifth of November - for Julia's New Book! Remember, Remember the Fifth of November - for Julia's New Book! 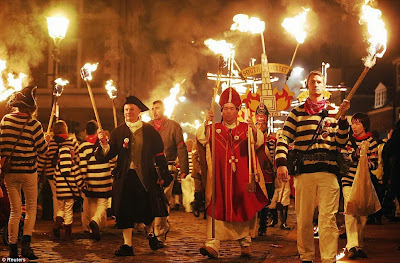 RHYS BOWEN: Here at Jungle Red we're jumping for joy, tooting our horns, waving flags and generally behaving with extreme excitement because today, November 5th, Guy Fawkes Day back in England, celebrates the release of Red Julia's new book. So I'm handing the floor over to her to tell you all about it. I'm in Pawleys Island, SC today, appearing at Litchfield Books, and I'll be on the move for the next two weeks, visiting Massachusetts, Houston, Michigan, Chicago, Arizona, New York and of course, Maine. You can find my whole book tour at my website and under the Events section of my Facebook. To celebrate, let's go all Oprah around here and give away three hot-off-the-presses hardcovers of THROUGH THE EVIL DAYS to three lucky commentors! You get a book! And you get a book! And you get a book! 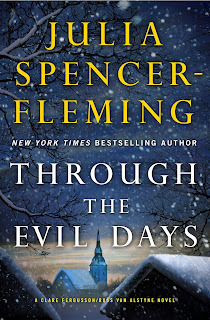 For those if you in the UK: THROUGH THE EVILS DAYS is being released today from Headline Publishing! Yes, all eight of the Clare Fergusson/Russ Van Alstyne series are now available in the UK. So grab a light and a few of your friends and head down to your local bookshop to pick up a copy today! I believe these are eager Britons marching to Waterstones to demand THROUGH THE EVIL DAYS. Julia, I love that picture at the bottom— The march on Waterstones! I have two priestly friends, one from the UK and one from Maryland who just ordered your book. I tell everyone about Clare and Russ! I tell everyone about Clare and Russ, too, and you, Julia. Look forward to seeing you again at Crime Bake. Your new book was my choice for Wicked Good Crime Bake Reads on our blog tomorrow (http://wickedcozyauthors.com/)! Reds and visitors, hurry out and get this book today. I love every entry in Julia's series, but this one really stands out. You will freeze, you will worry, you will sigh with relief and despair--and then say, wait, she left us like that?? Hearty congratulations, Julia! I adore your books and this one sounds especially fabulous! P.S. You and your outfit for TV look terrific.... Can Hank please do a blog post teaching us all how to dress and accessorize, for TV or not? Experience has shown me that when I read any of Julia's books set in wintertime, I end up feeling like I need to be treated for frostbite - even if I'm reading outside in the middle of a record-breaking July heatwave! So (what I did with another of her books set during the winter) I will probably purchase it (unless I win it, of course:-) and wait until after the last frost before I read it! Congratulations Julia! I can't wait!! Congratulations, Julia . . . "Through The Evil Days" is simply superb! It's an outstanding addition to a wonderful series . . . .
Congratulations Julia. I can't wait to read the new book. Congratulations, Julia! Going out to purchase now. Have a great tour! HURRAY HURRAY HURRAY! I can tell you, Reds, this book is WONDERFUL! I hope to see you at the Poisoned Pen. Can't wait to read the new book! Can I just say "cold?" Two tributes to Julia's writing--one, you won't be able to put the book down, and two, you'll want your down comforter, your wooly socks, and a mug of hot chocolate while you're reading!!! I loved Through the Evil Days! Julia, your books just get better and better, and now I can wait to see what you throw at the characters next. I second Susan on this--can Hank do a blog giving us all tips on what to wear on TV? That was meant to be CAN'T wait!!!! 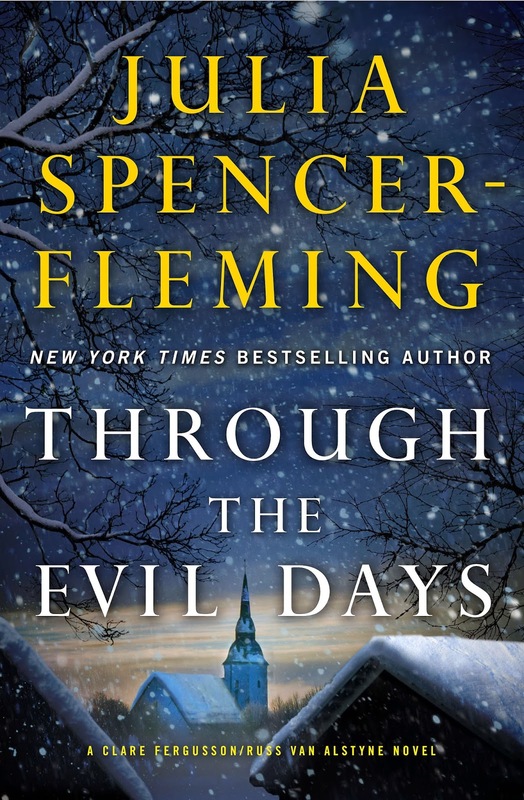 Since I was fortunate enough to win an ARC of THROUGH THE EVIL DAYS, I've already read it. And can pronounce it Julia's best yet in this series. Once I started reading it I could not put it down, the suspense was gripping throughout the entire book. The story line is so compelling, it left me wrung out by the time I finished it. Thank you, Julia, for these strong and appealing characters. Their flaws are as interesting as their strengths. We read through them in one sitting and CAN'T wait until the next one. I'm headed for a three-day break in mid-November and your book is on my list, Julia. But I don't know that I can wait that long and now it sounds like I'll have to wait again for the cliffhanger (?) to be resolved. Nevertheless, it's a problem I don't mind having --- congratulations! Congratulations! This sounds like a terrific book to curl up with during one of our MN snowstorms (3-5" expected tonight - I'm so not ready). This is another absolutely stellar book. I stayed up all one night to read it (when I REALLY shouldn't have) because I could not put it down. Leave me out of the drawing. I received an ARC to review and my pre-ordered hardcover should be available at my bookstore today. PS Yesterday, I did an interview for NaNoWriMo for the national public radio show about writers and books, New Letters on the Air, and mentioned you (and your new book baby) as one of the best writers being published today. It'll broadcast later this month on different times and days, depending on your local NPR station, but I'll post the link when it goes up on the website. Congratulations, Julia. I can't wait to read Through the Evil Days, and look forward to seeing you at Crime Bake. Congratulations, Julia! I have been waiting, and waiting for this book to be published!! Eager to get my hands on a copy and start reading!! I lucked out and won an ARC from you just a couple of weeks ago. I so enjoy reading about how Russ and Claire's relationship keeps evolving. And finally Julia reveals what the burr under the saddle is with Russ and the statie! For some reason I have song lyrics running through my mind in connection with the release of Through the Evil Days. "Oh happy day" and "High as a flag on the Fourth of July" are two that keep looping around. Congratulation, Julia, on what I know will be another fantastic book. I fully expect to be one of the up-all-night readers of it. I pre-ordered it from Amazon, so I'm hoping that means it will be in the mail today. As you might be able to discern, I am a bit excited. Oops, that should have been "congratulations," not "congratulation." Congratulations!!!! and I'll be bringing my copy to Birmingham in February for you to sign (can't wait!). I loved this entrant in the series, Julia! The whole series is great--I always know I'll be in for a good read, worthy of a weekend on the couch. Congratulations on the new book! I picked your first book up several years ago and was hooked. I started going to your website after that just to see when the next book was coming. That led me to Louise Penny, after reading an interview you did with her, then to the rest of the Jungle Red writers and now to several of the guest writers on this blog. I can't thank you enough for expanding my reading list. I ditto Susan's idea: a Hank post about clothes and accessories! It's here it's here! .... and just got an email from AmazonUK saying that that they've shipped a copy as well. Now to put out the Do Not Disturb sign and start reading. From what I'm seeing here, I'd better turn up the heat and put on a warmer sweater. Heating up my microwaveable slippers and slipping on my fingerless gloves, wrapping up in my Snuggie... Congratulations, Julia! I've already got my copy. I'm afraid to read the jacket cover because I just finished book four and I don't want to know what happens. I love your books! This book is so bloody good! I loved it. Couldn't put it down. Congratulations, Julia. Enjoy the tour. Not sure I can get to Portland tomorrow but I did share the events on FB so maybe some of my local friends will go. Yay! Another installment. Love this series.